Every staff member brings years of experience to each new project. We custom produce all work to meet your specific requirements in any style or subject matter, using a variety or combination of materials. Design work and samples are priced in stages. Project costs are based on the scale and complexity of each particular project. There is no charge for the initial consultation. In a step by step process our creative team begins with your concept or drawings to define objectives. KOZAN STUDIOS maintains a vast library of resource materials and showroom samples to assist our clients with targeting particular details. We can design your project to fit a predetermined budget or present you with various options in design & media for your consideration. We routinely present preliminary drawings for your initial input, adjusting the design until it meets your goals. We follow with a finalized scale layout, samples or maquette for your approval before the actual work begins. 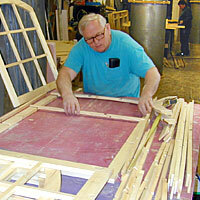 Projects can be fabricated in our studio or on-site worldwide. In-progress work can be monitored with studio visits, digital photos or on-line videos. KOZAN STUDIOS is dedicated to building successful relationships by translating your ideas into reality. With your input, our goal is a final product that reflects the vision of the designers and client. We welcome the opportunity to estimate any type of project. We enjoy new challenges and are ready to create something special for your project. Browse this site to view some of our completed work.